Who wouldn’t want a theme song to play every time they enter a room? The Sound Perfume glasses are an intensely nerdy-looking accessory that will equip you with not only your own song, but with a signature scent. The strange device was developed by a team of researchers at Keio University in Tokyo to improve interpersonal relations between friends and acquaintances. 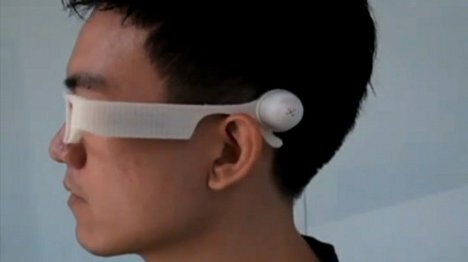 Using the Sound Perfume glasses and an app running on your mobile phone (and connected to the glasses via Bluetooth), the system creates a unique sound and scent impression for every one of your friends. 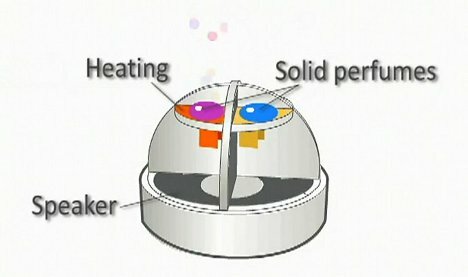 The face-mounted device features two small speakers and a scent module containing eight varieties of solid perfume. When you meet someone else using Sound Perfume, you choose a distinctive personal sound and scent for that person. Every time you encounter them again, your phone recognizes them nearby and releases the sensory reminders you’ve selected. It is hard to imagine anyone willingly wearing these funny plastic glasses, much less enough people to make it a widespread thing. But the idea brings up an intriguing connection between scent and recognition. Aromas are closely tied to memory, which is why you can catch a whiff of perfume or cologne and be instantly reminded of someone you haven’t seen in years. This concept uses that connection to create a unique memory link between you and the important people in your life. See more in Cybernetics or under Technology. January, 2012.